Obituary for David Ward Casper | Loftus-McManus Funeral Homes Inc.
David Ward Casper, of Yuma, AZ, was born in Santa Maria, CA on August 16, 1964. He died on August 17, 2018, at the age of 54, at the home of his parents in Metropolis, IL after a long illness due to throat cancer. A memorial service will be held at 10am on Thursday, November 8, 2018 inside the Yuma Proving Grounds Chapel located at YPG in Yuma, AZ. Immediately following is his “ash drop” over YPG around 12 noon. A celebration of life luncheon will be held around 1pm. Everyone is welcome. David accepted Christ as his Savior as a teenager while he and his parents were living in Isfahan, Iran, and was baptized in the Caspian Sea. He was a good and faithful servant, and loved reading his Bible. He was a humble man who never spoke of his accomplishments. 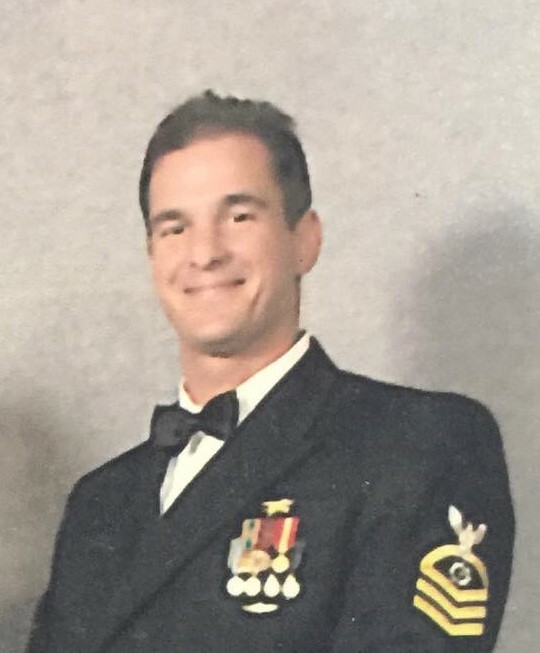 David was a retired Navy Chief Petty Officer who served in the Navy for 24 years. Twenty-Three of those years he served as a Navy Seal. He was a member of Seal Team 3, Seal Team 4, Navy Seal Leapfrogs Parachute Team, and a Military Free Fall Flight Instructor for advanced students in High Altitude Low Opening (HALO) free fall flight. He earned the respect of his fellow Seals with whom he served and was a strong defender of this nation. When he retired from the Navy, he stepped into a similar role as a civilian at Yuma Proving Grounds in Yuma, AZ. David will be greatly missed by family and friends. He leaves behind his wife of nearly 11 years whom he met in 1990 during his first deployment overseas, Cecile “CeCe” Perea Quiambao of Yuma, AZ; his parents, Ward and Norma Ethridge Casper of Metropolis, IL; two sisters, Susan E. Casper Welch and husband Ron of Georgetown, TX and Barbara J. Casper Andrews and husband Daniel of Irving, TX; father-in-law, Gregorio M. Quiambao, Jr. of the Philippines; sister-in-law, Susana Marin Casper of Harker Heights, TX; six nieces and nephews, Zachary Andrews of Richardson, TX, Melissa Andrews of Irving, TX, Jessica Casper of San Antonio, TX, Aaron Casper of Dallas, TX, Elijah Welch of Georgetown, TX and Amanda Casper Schlicht of Seoul, South Korea; four great nieces, Gracie and Skyla Andrews and Lucienne Pagan all of Texas and Emma Rose Schlicht of South Korea. Aikins-Farmer-Loftus-McManus Funeral Home in Metropolis is entrusted with the local arrangements. Condolences may be left online at www.aikinsfarmer-millerfh.com.